In between panic attacks and chocolate binges — I am a college teacher and it’s almost finals week — I am reading Alain de Botton’s 2009 meditation on the economic and material structures that shape our lives, [%amazonProductLink "The Pleasures and Sorrows of Work" asin=037542444X]. Like Malcolm Gladwell, Henry Petroski, and Michael Pollan, de Botton points at stuff the rest of us are ignoring and asks two kinds of questions: What are these things, and why were we ignoring them? Throughout The Pleasures, de Botton repeatedly concludes that our actions are easier to understand if we look at the totality of forces that tug us forward or hold us down. He reminds us, for example, how electricity-transmission towers — or pylons, as the British apparently call them — creep almost unnoticed alongside highways and rivers despite their centrality to modern human life, not to mention the sizzling wattage they carry inside their insulated bundles. Marketing experts and librarians struggle to label de Botton’s work; his books can be found in the philosophy, self-help, architecture, and sociology sections of your local bookstore. If he had been born 300 years ago, de Botton almost certainly would have been considered a belle lettrist, someone who writes lovingly and beautifully about whatever he thinks the world needs to know. His analysis is more than mindfulness; it’s worldliness in mindfulness. Worldlymindfulness. This book made me think of something curious cooks can do if they want to see the world flowing into their kitchens: Open a kitchen drawer and, before you touch anything, look at how the objects contained within the drawer nest together or jostle about at odd angles. The drawers in my kitchen change depending on who last unloaded the dishwasher. I segregate items by general use (baking, frying, slicing, consuming, etc.). 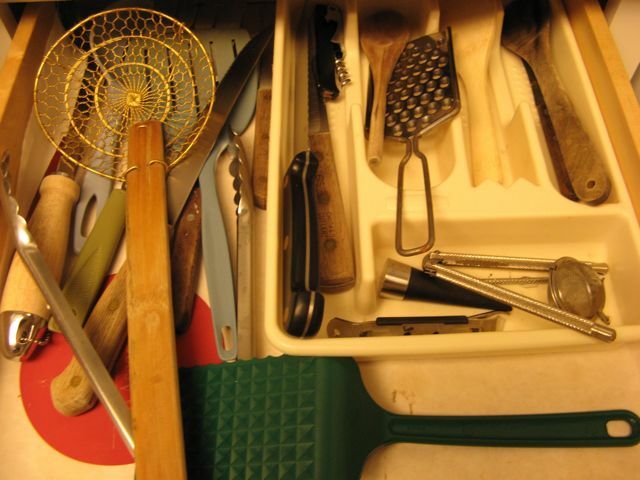 My husband, on the other hand, puts the tools he uses in one very accessible drawer and banishes all the rest to what I would call “the baking drawer,” a spot a bit farther out of the way and a good deal less commodious than the drawer he prefers. When the Chinese strainer temporarily goes missing, I chuckle as I fish its shiny mass from the “baking drawer,” knowing it has fallen once again into the category of stuff one of us doesn’t use. As you might guess, the drawer next to the stove sometimes becomes a riot of tools, each one speaking its use into the ear of an unaccustomed partner. Pull something from the jumble and look at its label. Like all stuff, it must have come from somewhere. Has it swum from China or flown from Germany? Were these ladles and knives and tongs molded thousands of miles from where their metals were formed and mined? How much better traveled are they than me? How fully do I dare think about the people who mined the ore from which this was made, or who machined the handle? Have I abetted their sadness or joy? What is this tool made of? Is it alloy or pure metal? An oil or sand product? Stainless steel or aluminum or plastic or silicone? And if plastic, what kind? One that flakes into the air at the slightest thermal provocation? Or a steadfast plastic, the kitchen equivalent of the U.S. postal service, delivering its contents through sleet, rain, or tear-sodden 30th-birthday cake-making? What flaw in a previous tool did the engineers have in mind as they began to design the one I hold in my hand? What flaw in my hands is this tool fashioned to help me ignore? As de Botton would be quick to remind us, we often define labels narrowly. A label is not just a sign affixed or embossed by a boastful manufacturer. It is any clue to an object’s history. Experience accumulates as an object wobbles through space and time, adding and subtracting atoms in this perpetual-motion machine we call home. Because my kitchen drawers are populated mostly with hand-me-downs and thrift-store finds, the paint on these tools has worn, the metal scratched. Little pits like those that sometimes riddle cheap sweaters have appeared on my plastic handles. I also detect a few small fringes where the plastic was not quite contained by the original molds. The ruff on my green spatula looks like the beard on a razor clam; if I grabbed it and pulled, would pearlescent abalone be revealed? As you can imagine, this exercise is a fine means of procrastination. More than that, though, it is a chance to see a living situation entwined with values — still life with 30-year-old spatula. With Black Friday 2010 in our rearview mirror and a new year of buying, storing, and cooking ahead, it seems the time is a ripe for a little kitchen-drawer introspection. What are you finding in those funny rectangular boxes?